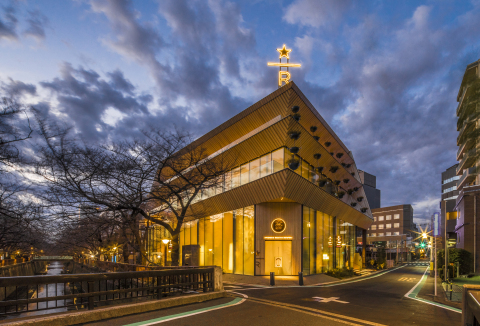 TOKYO--(BUSINESS WIRE)--Feb. 26, 2019-- Today, Starbucks (NASDAQ: SBUX) celebrates the opening of the Starbucks Reserve® Roastery Tokyo, a four-story tribute to premium coffee quality, innovation and human connection. This will be the fifth Roastery globally, opening to the public on Thursday, February 28, at 7 a.m. JST, reaffirming the company’s 23-year commitment to Japan. The Roastery pays tribute to the important role that Starbucks Japan has played in shaping the foundation of the Company’s international growth. The Roastery introduces customers to more than 100 unique coffee and tea beverages and merchandise, as well as a menu of artisanal Princi Italian fare for the first time in Japan. It also celebrates the Japanese culture of connection and craftsmanship through the first AMU Inspiration Lounge – from the Japanese “amu,” meaning “knit together”– to host community gathering events and is planned to become Starbucks first Specialty Coffee Association certified training location in Japan. Located in Tokyo’s vibrant and creative neighborhood of Nakameguro, the Roastery’s enchanting design was inspired by the famous cherry blossom trees lining the Meguro River. The building’s glass walls and terraced floors seamlessly fold into the fabric of the neighborhood, bringing visitors eye-level with the cherry blossoms and the four seasons of the river to reflect the natural beauty and sense of harmony found across Japan. The Tokyo Roastery is the only Starbucks Roastery location designed in collaboration with a local architect from the ground up. The exterior was brought to life in collaboration with renowned Japanese architect Kengo Kuma. Envisioned by Liz Muller, Starbucks chief design officer and lead designer for all five Roasteries globally, the Roastery highlights the work of local craftsmen and women to create an enchanting destination for coffee exploration and discovery. The Tokyo Roastery merges traditional and modern design to deliver a unique and inspired experience across all four floors. Upon entering the Roastery, customers are greeted by the world’s largest Starbucks Roastery coffee cask, four-stories and over 55 feet of blush-tinted copper adorned with hand-crafted copper cherry blossoms, which changes hues throughout the day in different lights. The expansive cask was built using the technique of tsuchime, a tradition of copper beating, where each person involved in the building of the Roastery was offered the chance to hammer a portion to create its texture and pattern. The cask’s unique color is balanced against the light wood which has been carried into the interior to give the store a brightness found throughout traditional Japanese architecture. Throughout the Roastery, local craftsmen and women were brought together to incorporate their expertise and traditional craft into the design elements. The wood-tiled ceiling was inspired by the art of origami, providing a stunning visual experience. The light and airy space carries the lightwood used on the exterior to the inside, giving the experience an enchanting aura. The wood, sourced locally, has been treated throughout with a traditional technique which prevents it from aging, ensuring the brightness is maintained inside and outside in the years to come. The coffee journey at the Reserve Roastery Tokyo is an immersive experience and education in coffee, and its process—from green bean to cup—which begins at the Main Bar on the first floor. The open floor plan draws customers into the immersive experience, introducing them to the skilled art of roasting, brewing and hand-crafting beverages. The Reserve Roastery serves the freshest cup of coffee and it is here on the first floor that customers can taste Reserve coffee beverages such as Barrel-Aged Cold Brew. The Princi bakery serves handcrafted, authentic artisanal Italian fare that is baked fresh in the Roastery throughout the day. For the first time in Japan, customers can enjoy freshly-baked breads, cornetti, focaccias, pizzas, salads and more. An airy staircase leads to the second floor, where customers will be transported into the tradition of Japanese tea at the world’s largest Teavana Bar. Exclusive tea beverages, such as the Pop’n Tea Sakura Jasmine, featuring a vibrant hibiscus and cherry popsicle atop a floral jasmine tea, will delight customers with their charming appearance, Japanese ingredients and unique flavor combinations, modernizing the tea experience. On the terraced third floor, Starbucks Japan’s first cocktail bar, Arriviamo™, puts innovation, mixology and cocktail craft on full display. The two walls of spirits bring together the Arriviamo menu, featuring coffee and tea-inspired cocktails only available at the Tokyo Roastery, including the Nakameguro Espresso Martini made with chestnut liqueur, crème de cacao and espresso, then paired with decadent chocolate from Nakameguro’s “green bean to bar CHOCOLATE” brand. Wine, beer and classic mixology beverages will also be available. Starbucks Japan has more than two decades contributing to the communities it serves. The fourth floor of the Starbucks Reserve Roastery Tokyo is home to AMU Inspiration Lounge – a dedicated space for the community to gather for hosted social impact conversations. The concept of “AMU,” which means “to knit together” in Japanese, is founded on human connection and passions coming together, something Starbucks has long believed in. For the first time at any Starbucks location in the world, this intimate space will serve as a platform to host change-makers and creative thinkers from across Japan. The first event in April will celebrate the role of women leaders in Japan. The Roastery is planned to become Starbucks first certified Specialty Coffee Association (SCA) location offering training for coffee professionals in the near future. With more than 37,000 partners who proudly wear the green apron across Japan’s 47 prefectures and 250 at the Roastery itself, Starbucks Japan will amplify coffee craft and innovation by freshly roasting small-batch coffees from around the world every day in Tokyo and introducing new beverages, concepts and inspiration to all 1,400 stores across Japan. This amplification will begin with Tokyo Roast coffee, a StarbucksJapan-exclusive coffee, available throughout the market on opening day.